We are at present living with my sister (or she is living with us, whatever) who has been vegan for several years now. Little by little, her continued insistence (not in a nagging way, but in an I-care-for-you-and-your-health kind of way), started to make an impact on me. I asked my wife one day if she would like to try going vegan for a few weeks after reading in Vegan Planet of the health benefits. She agreed to give it a go, and the challenge had begun. During those three weeks, I think we ate better than we ever had before. All of a sudden, there was a deliberate effort on both our parts to consider what we were eating, and how it was impacting our health and the general environment. After Googling vegan, and arriving at the PETA web site, I suddenly realized just what my previous eating habits had been doing to the environment, and to animals in particular. So what started out as a practicality (we can all eat the same meal at home now) coupled with a healthier diet has turned into taking a stand for animal rights and the environment (at least on my part). My wife and I are both healthier now than before, and we have no plans to ever return to our carnivorous past. Attention world…meat is not the only source of protein! Anyway, that’s it for today, at least from me. The advantage of this blog is that all three of us post to it, so perhaps someone else will add their bit today, or perhaps not…stay tuned! 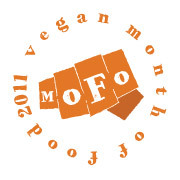 Congrats on your venture into the vegan world! Keep up the great work and great food!